Heart disease is the leading cause of death for both men and women in the United States according to the Centers for Disease Control. High blood pressure, high cholesterol and smoking are all significant risk factors for developing a cardiovascular condition. Today, there are many new advances to treat heart disease and save lives. 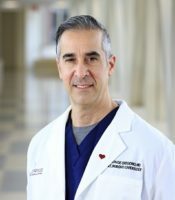 We talked with cardiologist Dr. Joseph De Gregorio, section chief of Invasive Cardiology at Englewood Hospital and Medical Center, about heart disease and his team’s approach to treating and managing it. Q: What do you find most exciting about treating patients with heart disease today? There are great advancements in the technology that allows us to do more in a less invasive fashion. In cardiology, we are able to fix a lot of the problems that we find and we can do it with less invasive procedures than even just a decade ago. Things have changed a lot in the 20 years that I’ve been practicing medicine. For example, critically ill and elderly patients who were too high risk for certain procedures in the past can now be helped tremendously. We are able to save lives and improve the quality of life for patients for whom there were no options even just a few years ago. Q: Are there new technologies that improve care for patients? Dr. De Gregorio: TAVR—One of the most dramatic differences is in aortic disease, which commonly occurs in elderly or very elderly patients. In the past, the only option was surgery to replace the damaged valve, which could be very high risk, especially for patients with co-existing conditions, and the recovery from surgery can really be very traumatic. Now we can put a new valve into the heart through catheters, which is much less invasive, the recovery is much quicker and the patient generally goes home the next day. At Englewood Hospital, we were one of the first hospitals in the country to perform transcatheter aortic valve replacement (TAVR) after it was FDA approved in 2011. TAVR provides a treatment option for patients with severe aortic stenosis who are at intermediate to high-risk for cardiac surgery. We perform these procedures as a team with Englewood’s cardiothoracic and vascular surgeons and have treated over 250 patients with a high success rate and outcomes better than the national average. Absorbable Stents were FDA approved last year after clinical trials in which Englewood Hospital participated. A traditional metal coronary stent acts as scaffolding to open up the artery. The absorbable stent is the evolution of the technology. These new stents start to be reabsorbed at six months. The idea is that you don’t need the stent anymore because the artery has healed in an open position. Right now, it’s not for everyone, but in the future perhaps this will be standard treatment. We’re trying to help evolve this technology. Other new catheter-based technologies include MitraClip to treat mitral valve regurgitation, chronic total occlusion PCI, for opening total coronary blockages, and Impella®, a life-saving device used to sustain circulation for critically ill patients at high-risk for an interventional cardiology procedure. Q: What sets your cardiology practice apart from others? Dr. De Gregorio: At Bart De Gregorio, MD, LLC, we have eight cardiologists in our practice and each is specialized. We have expertise in each subspecialty of cardiology to care for adult patients of all ages with any kind of heart condition. We’ve structured our practice so that can each physician can be very efficient in applying their expertise. For example, I’m based onsite at Englewood Hospital for invasive procedures and to see patients in the hospital. We have the efficiency and personalized touch of a smaller practice. In our office in Glen Ridge, we perform all outpatient non-invasive testing for diagnosing cardiovascular disease, including: nuclear stress testing, echocardiography, Holter monitors, carotid artery and peripheral vascular disease testing, CT angiography and more allowing us to perform tests and interpret all results right in our office. This means we can provide specialized expertise and a superior level of quality and convenience for our patients. Our philosophy has always been to provide the best quality of care. However, it’s not just having skilled physicians who understand how to diagnose and treat cardiovascular disease, but also about how we treat the patient as an individual. We have a highly personalized environment. We know our patients and their families and they know us. We’ve created an environment where patients feel comfortable – including with our staff, in our office setting, and in their relationship with their physician. If a patient calls up and says they are having a symptom, we act quickly. We are very available and active in treating patients. Q: How does teamwork improve care for patients? Dr. De Gregorio: Part of what makes Englewood Hospital unique is the collaboration between specialists in the Heart and Vascular Institute. We have a real team approach and camaraderie which results in optimal care for the patient. Collegial relationships among the specialties allow us to be involved with some of the newest technological advances to treat cardiovascular disease. It is an incredibly important aspect of our care for certain patients, such as TAVR, where interventional cardiologists, cardiothoracic surgeons and vascular surgeons all have a role in the procedure. Q: What is the most important takeaway? Dr. De Gregorio: The great thing about cardiology is that we find problems and we treat problems: most often this can be done with minimally invasive methods. You want to address things early. When we find things earlier, they can be treated before they cause any problems. We have ways of treating your condition that are safe and effective, so it’s important to be evaluated.